Figure 1b: Magnetic small angle scattering pattern of a Co/Pt multilayer recorded with a single 30 fs FLASH pulse. The photon energy was in resonance with the Co M2,3 edge at 20.8 nm. Figure 1a: Schematics of the single-pulse magnetic scattering setup. Figure 2: Magnetic SAXS patterns from six subsequent 30 fs illuminations of the same Co/Pt multilayer sample. 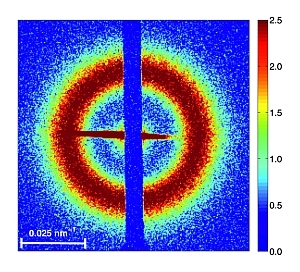 Published as: “Single-pulse resonant magnetic scattering using a soft x-ray free-electron laser”, Phys. Rev. B 81, 100401 (R) (2010). Single-pulse resonant magnetic scattering experiments were performed by using soft X-ray pulses generated by the free-electron laser FLASH. A magnetic diffraction pattern was recorded from a Co/Pt multilayer sample at the Co M2,3 edge with a single 30 femtosecond long FEL pulse, without destroying the sample. FEL sources have the potential to enable the recording of a magnetic diffraction pattern within a few femtoseconds (fs) exposure and thus to probe elementary magnetization dynamics such as spin-flip processes and their coupling to the electronic system on their intrinsic time scales in the fs regime . The unprecedented peak power of FEL sources also implies that a considerable amount of energy is deposited in the sample. The radiation damage threshold defines the borderline between nondestructive and therefore repeatable pump-probe type of magnetic scattering experiments and high-fluence destructive single-pulse experiments . Beam damage renders single-pulse scattering from magnetic samples especially challenging as one would ideally take femtosecond snapshots without modifying samples and quenching the spin system. Recently the first resonant magnetic scattering experiments at FLASH by using the fifth harmonic of 8 nm to obtain magnetic scattering contrast at the Co L3 edge were carried out . Now, the fundamental wavelength was set to 20.8 nm (59 eV), which is in resonance with the Co M2,3 edge, yielding magnetic scattering contrast. FLASH was operated in single-bunch mode with a repetition rate of 5 Hz. The pulse duration was 30 fs with an average pulse intensity of 2 μJ, which corresponds to 2 x 1011 photons per pulse on the sample in a beam size of 250 μm. This results in a photon fluence of 4 mJ/cm2 and a peak power of about 1.3 x 1011 W/cm2. 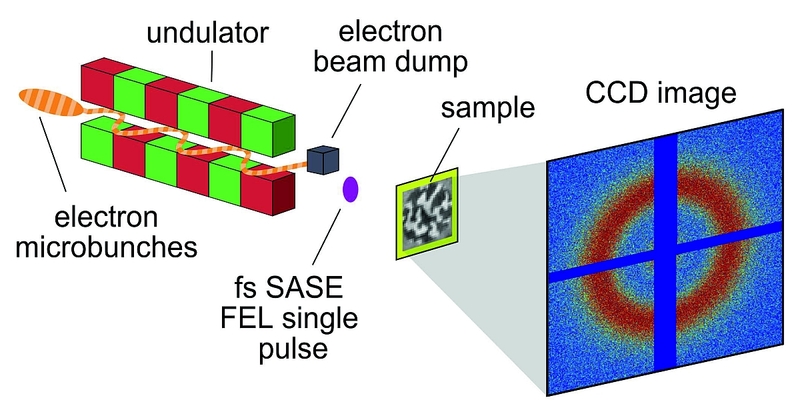 The experiment has been performed at beamline BL1 at FLASH which utilizes the direct FEL beam without a monochromator (see Fig 1a). The natural bandwidth of the SASE radiation ΔE/E ≈ 0.5 % - 1 % is sufficiently small to allow for resonant scattering at the Co M-edge. A toroidal mirror produces a beam size of about 150 μm in the focal plane. Our samples have been positioned slightly out of focus resulting in the beam size of around 250 μm on the samples. Fig. 1b shows a resonant magnetic SAXS pattern recorded with a 30 fs long single FEL pulse with a pulse energy of 4 μJ. A subsequent illumination showed that the sample was not destroyed after the single-pulse exposure. 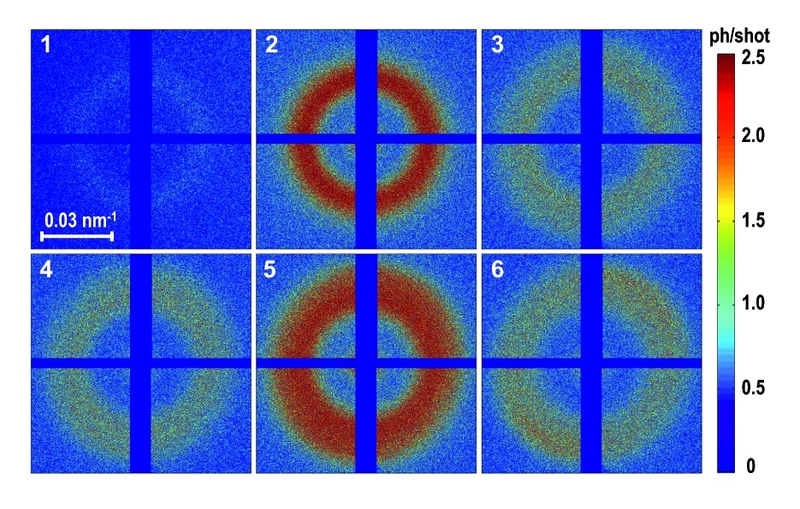 The scattering ring reflecting the spatial correlation via = 2π/Qmax = 200 nm of the magnetic domains is clearly visible. The existence of magnetic scattering proves that the spin system temperature is below the Curie temperature of the multilayer sample during the exposure time. It is worth mentioning that even FEL pulse energies 10-20 times larger than the one applied here allowed us to record a single-pulse magnetic diffraction pattern. Those high pulse energies destroyed the sample although the spin system is still not quenched during the exposure time of 30 fs. Fig. 2 shows a series of magnetic diffraction patterns taken from the same sample spot. Each pattern was acquired by using a single 30 fs long FEL pulse. The time delay between the images is around 3-10 seconds. Due to the statistical nature of the SASE process the FEL pulse energy was higher for pulses number #2 and #5 than for the rest of the pulses. The SAXS ring from the magnetic domains is visible in the first two images at Qmax = 0.026 nm-1 reflecting a mean domain size of around 120 nm. After the higher intensity of pulse #2 the third image shows a larger and broader ring, and after the second high intensity shot #5 the maximum of the ring in image 6 is again shifted to larger Q-values. The observed changes in S(Q) are caused by permanent changes in the structure of the magnetic multilayer. SEM pictures of both unirradiated and irradiated areas of the sample revealed an increase in the grain size upon irradiation with the FLASH pulse indicating structural changes that may affect the magnetic properties . As an additional effect, pinned domain walls forming a magnetostatically metastable state may be released due to thermal activation after the FLASH pulse. In conclusion, we demonstrated non-destructive resonant magnetic scattering using single pulses from the free-electron laser FLASH. Pulse energies of 4 mJ/cm2 are sufficient to record a magnetic diffraction pattern within 30 fs without destroying the sample. E. Beaurepaire, J. C. Merle, A. Daunois, and J. Y. Bigot, "Ultrafast spin dynamics in ferromagnetic nickel", Phys. Rev. Lett. 76, 4250 (1996). H. N. Chapman et al., "Femtosecond diffractive imaging with a soft-X-ray free-electron laser," Nature Phys. 2, 839-843 (2006). C. Gutt et al., "Resonant magnetic scattering with soft x-ray pulses from a free-electron laser operating at 1.59 nm", Phys. Rev. B. 79, 212406 (2009). C. Schuppler, A. Habenicht, I. L. Guhr, M. Maret, P. Leiderer, J. Boneberg, M. Albrecht, "Control of magnetic anisotropy and magnetic patterning of perpendicular Co/Pt multilayers by laser irradiation", Appl.Phys.Lett. 88, 12506 (2006).